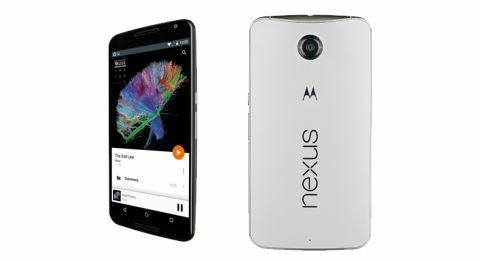 Google Nexus 6 review | What Hi-Fi? It’s almost impossible to pick up the Nexus 6 and not make a comment on its size. Packing a 6in display, it’s one of the largest smartphone screens on the market, and not that long ago would have been considered a small tablet rather than a take-everywhere phone. How times change. While there’s no denying it’s big, it doesn’t feel quite as ridiculous in the hand as perhaps it once would have. Big-screen smartphones such as the Samsung Galaxy Note 4 and more recently the Apple iPhone 6 Plus have only helped cement the big-screen trend as here to stay. The Nexus 6 is Google’s effort, but does it prove that anything they can do, it can do better… or just bigger? The Nexus 6 itself is made by Motorola, which puts it in good hands if the most recent Moto X is anything to go by. In fact, it bears more than a passing resemblance to its stablemate, with the same curved back panel and indented M logo that provides the perfect place for your finger to rest in when you hold it. We liked the design on the Moto X and we like it here in its bigger format too. It’s a wholly plastic design, but feels well-built and sturdy, available in a choice of blue or white. It doesn’t have the premium design of the iPhone 6 Plus then, but many will find its gently rounded back panel and flat edges easier to hold, particularly at this size. Speaking of the iPhone 6 Plus, there’s really not much between it and the Nexus 6 in terms of physical size, despite the iPhone’s screen being 0.5in smaller. The Nexus 6 is certainly wider, but height-wise there’s hardly anything in it. If you’re happy with the size of the big-screen iPhone, you’ll have no grumbles here. Yes, you may well find yourself using two hands to text – only the biggest hands will be able to stretch from one side of the screen to the other comfortably, but then that’s almost a given with a device this size. If you’re really unsure, we’d pop into a shop that stocks it for a test run before you dive in. There are very few physical controls on the Nexus 6, save for the ridged power button and volume rocker on the right hand side. The 3.5mm headphone jack is placed in the middle along the top of the handset, with the nano SIM card slot next to it. There’s no microSD card slot here though, which is a shame – you’ll need to choose wisely between 32GB and 64GB when you buy it to ensure it satisfies your storage needs. Under the hood, the Nexus 6 packs one of the most powerful chipsets currently available in mobile phones, comprising Qualcomm’s 2.7GHz Snapdragon 805 quad-core processor, the Adreno 420 GPU and 3GB of RAM (the new HTC One M9 and Samsung Galaxy S5 might just pip the Nexus on paper). It certainly seems to do its part, and the Nexus 6 feels quick and responsive when zipping around menus, multitasking or playing games. Even with really graphic-intensive apps, such as Gameloft’s Asphalt 8: Airborne, we don’t suffer from stutters or long load times at any point – it’s smooth and stable throughout. Such a big screen needs a decent-sized battery to power it, and fortunately the Nexus 6 packs a 3220mAh power pack to do just that. Moreover, it packs Qualcomm’s QuickCharge 2.0, meaning you can get up to six hours of charge from a depleted battery in just 15 minutes. This isn’t the first time we’ve seen this feature, but it’s among the first times we’ve seen the charger required to make use of it included in the box as standard. Wireless charging is also available using Qi-compatible accessories, though you’ll have to buy these separately if you want to take advantage. The cell’s performance is an impressive one too. Our battery rundown test, running a 720p video with wi-fi on at half brightness, saw it lasting around 10 hours – matching the likes of the iPhone 6 Plus – and in regular everyday use we managed to get around a day’s usage out of it. And so to that screen. At 5.96in, it’s just screaming to be used for watching films, with a Quad HD 1440 x 2560 resolution and 493ppi putting it right up there with the screens of the best phones on the market, on paper at least. In use, it can’t quite match up to the Galaxy Note 4 or iPhone 6 Plus’s video performance, despite its resolution advantage over the latter. But it gives it a good go. Watch a full HD clip and the screen looks plenty sharp enough with both text and images. It’s not until it’s compared with Apple’s handset that you notice some of the finer details are a little soft in comparison. Landscape scenes don’t have the same depth to them and textures, like the fur on Paddington Bear, aren’t quite as well realised. The Nexus 6’s colour palette certainly has a warmer tone to it than the iPhone too, but which you prefer will be down to personal choice. We’d say the iPhone probably just pips it when it comes to absolute balance, but there’s no doubting the richer, more vibrant tone creates a visually impressive picture that is punchy and engaging rather than hugely unnatural. When it comes to contrast, it’s a mixed bag. The Nexus 6’s whites are on the creamy side, even in menus and webpages, meaning they don’t pop as much when in dark scenes – but blacks do go deep and are decently detailed to boot. We watched a couple of movies on its screen and it didn’t feel strange to do so – the 6in screen is somewhat of a sweetspot for great mobile movie marathons, and meant we didn’t even feel the need to cast it to our TV once we got home. Aside from its large screen, one of the biggest talking points of the Nexus 6 is its inclusion of Android 5.0 Lollipop out of the box. As a Google device, it is of course vanilla Android with no tweaks, additions or skins, and easily the nicest way to enjoy Android on any device. This is the first time we’ve seen it on a phone, following its debut on the Nexus 9 tablet, and it’s not an insignificant upgrade – particularly in the way it looks, but also in performance stakes. Android is working harder than ever to impress, and we like it. It feels like a similar move to the one iOS took when taking the skeuomorphic switch from iOS 6 to iOS 7 – icons are simpler, colours are bolder and the overall appearance of it is flatter, stripped back and fuss free. Folders now appear as round circles, there are subtle new animations for opening and closing menus and the three main soft keys for navigation have been given a geometrical makeover too. Recent apps now appear in a rolodex-style graphic called ‘Overview’, giving you bigger previews of the apps and screens open than before (you’ll notice many of Google’s own apps have each been assigned a colour to make their tabs distinguishable in the line-up), and the app tray now sits on a new white background, peeking through to your homescreen and giving the feeling that your apps and processes are simply layered on top of one another, rather than new screen after new screen. Notifications now appear on, and are actionable through, the lock-screen (though this is completely customisable on an app-by-app basis) and there’s also a new ‘Priority Mode’, which is Google’s own ‘Do Not Disturb’ setting. You can set it for a certain amount of time, from minutes to days to indefinitely, and when activated it will allow only people and apps on your ‘Priority’ list to bother you with notifications, calls or messages. It can be toggled on and off by pressing the volume rocker. Finally, user accounts have been added to Android Lollipop, which although somewhat more useful on a tablet than a phone, means you can have several different users with completely individual homescreens and app selections, on one device. This might prove useful when handing over your phone to the kids for playing games, for example. Without a doubt, the pure Android experience has always surpassed that of any manufacturer-tweaked offering, and this alongside the Lollipop update serves as a big selling point for the Nexus 6. When it comes to music, Google’s all-accepting nature means there’s wider file compatibility than on an iPhone, with FLAC playback up to 24-bit/96kHz supported. Even so, its music capabilities fall short of that on the iPhone 6, lacking the level of dynamics and timing that we love on its rival. There’s drive to its character, but the organisation isn’t as tight and notes don’t deliver the same level of depth and dynamic subtlety. Listening to a Tidal stream of D’Angelo’s Sugah Daddy, it’s also clear that its presentation isn’t as precise as the iPhone’s, with leading edges of the notes in the piano intro a little soft and rounded, losing a bit of their impact in the process. Balance-wise, it’s largely neutral, though the treble can start to sound a touch thin at high volumes and with lesser quality files. Try a movie without headphones and the Nexus 6’s front facing stereo speakers do a good job at projecting a fairly solid, full-bodied sound directly at you, which the iPhone’s sideways-firing speaker just can’t compete with – especially in terms of immersion. We’d argue the iPhone’s speaker offers a little more clarity though, particularly to voices, and it’ll be down to personal preference which comes up higher on your list of priorities. The Nexus 6 packs a 13MP camera, which has seen some improvements to the one included on the Moto X, having a better sensor, optical image stabilisation and a wider f/2.0 aperture. However, despite it being a huge improvement on the poor camera of the Nexus 5, its performance still underwhelms when compared with the best at this level. On a bright day, it will produce sharp, clean and largely well-balanced shots with plenty of detail, but take it away from its comfort zone and there are a few niggles. The autofocus can take some time, particularly in tricky or low lighting. Add HDR into the mix and it gets worse, with several seconds needed for focusing and processing – something the iPhone 6 Plus does almost instantly. Its colour palette is similar to that of its movies, and leans towards the warm side, with bright colours perhaps more vibrant than is realistic. In low light, there’s more noise there than we’d want too, but add in the flash to combat it and the results can be overly bright, lacking the softer, more natural effect something like the iPhone’s True Tone flash has. For video, the Nexus 6 includes 4K filming at 30fps alongside its 1080p mode, but similarly to its stripped back stills camera, the video side of things is also kept relatively simple. There’s no slo-mo or hyperlapse features such as you’ll find on its competitors, but there are always apps you can download if it’s a feature you’ll really miss. And then there’s the matter of price. For so long the Nexus range has represented premium phones at an affordable price. This year, it’s perhaps slightly less so, but just because it isn’t £200 doesn’t mean it isn’t reasonably priced in its market. The 32GB version is available SIM free for £499, with the 64GB costing just £50 more at £549. Compare that to the Samsung Note 4 32GB at £599 and the iPhone 6 Plus 64GB (there is no 32GB option) at £700, and it doesn’t seem so bad after all. Google’s Nexus phones have always been a refreshing change from the norm, and the Nexus 6 undoubtedly continues that trend, but in a slightly different way to before. Its screen is a love-it-or-hate-it feature that will divide opinion in a way Nexus phones never really have, while its vanilla Android experience remains unbeatable among its competitors and alone makes a strong case for buying the Nexus 6. However, with a video and audio performance that can’t match up to either the iPhone 6 Plus or the Samsung Galaxy Note 4, we have to dock it a star from the full five. If you can get to grips with its size, this is a hugely likeable phone where simplicity is king. When it comes to pure performance though, the Nexus 6 is bigger but unfortunately not better.